Dr. C: Hey, everyone! 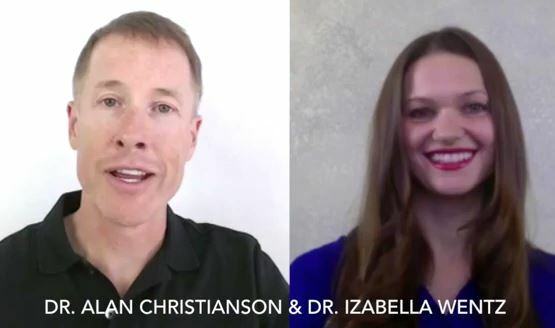 Dr. Alan Christianson here, and today, I am especially excited to be joined by my really good friend, Dr. Izabella Wentz. This is one more podcast in our series with the top health experts—my friends I get to hang out with. You hear their content, read their books and follow their blogs, but we are always curious what these experts do for their own health. I am going to ask Dr. Wentz what her biggest adrenal stressors are, and more importantly, the biggest factors that help. Whether it’s a mindset, supplement, a dietary routine, food or an exercise routine, what is the biggest needle-mover to keep her on track and sane? Dr. Wentz, it’s a blast to have you here. Dr. Wentz: So excited to see you, Dr. Christianson. How are you doing? Dr. C: I am doing awesome and even better now that I am seeing you. In terms of all you are up to, what is the biggest, single factor you find challenges your health or pushes you out of balance? Dr. Wentz: Sleep deprivation is one of the biggest aspects of adrenal fatigue, and my adrenals have been a challenge for me off and on for a long time. When I get to the point where I am overworking, having too much caffeine and not getting enough rest, I start to feel my adrenals slipping off. That would be the biggest thing. Also, stress—if I have a lot of projects, a book deadline or something else like that coming up, I can get really stressed. So, I would say stress and sleep deprivation are two of the biggest things that cause my adrenals to get a little bit out of whack. Dr. C: I would not want to lead anyone with this (as I want them to answer things in their own way), but that has been a strong theme with health experts. I think a lot of us have gotten to a place where we know the basic things not to do, but we’re still doing too much. So, your input is consistent with what many others have said. Let’s spend some time on the good part. What do you find is the biggest thing that keeps you on track; that really keeps you in balance? Dr. Wentz: Yoga classes are something I really enjoy going to a few times a week. It really helps break up the cycle of working too hard and doing too much stuff. It puts me in a nice, relaxed space during the class and after the class for a few hours, as well. I also like hiking, finding stuff I can do with my husband, my dog and my family—enjoying activities that are not work-related, like writing books or blogs or anything like that. I enjoy just taking time for myself, hanging out with loved ones, getting a massage or taking a hot bath. So, it is caring for myself and doing the things I love that bring balance into my life. Dr. C: That is so cool. The first thing that came up was yoga. Is this something new for you, or have you been doing it for a while? Dr. Wentz: I don’t want to tell you how old I am, but I have been doing yoga for a long time. I will go through periods when I’ll have yoga in my life and others when I won’t. When I do have yoga in my life, I feel my happiest and more relaxed. In some strange ways, I am more productive. So, even though I am taking more time away from working or doing projects, I still feel better and am more productive. Dr. C: Let’s get into a little more depth on this topic for people. What are your feelings about practicing yoga at home versus attending yoga classes? Dr. Wentz: For those who practice at home, I really envy them. Some people just remember their routines, and I am the type of person who has two left feet and does not remember routines. I thrive from going to a group class and the wonderful energy from the people around me. I also enjoy the music in the classes, and how they have you slow down with the music and breathe. When you are doing things at home, your phone can ring. I have a little dog that likes to try to do the “downward dog” on me as I am trying to do yoga. For me, it’s really nice to get away from home, but I know other people who have done yoga at home and find it just as beneficial. Dr. C: There are also different styles and types of yoga. What are your personal favorites? Dr. Wentz: I really like Vinyasa yoga, which is a flowing, slow and steady yoga. You focus on different poses and have to really concentrate and balance. You can’t think about any deadlines, projects or someone who got you mad at the grocery store because you have to stay focused, or you might lose your balance and fall. I also like Hot Power yoga, which can be a little more advanced. It puts me in a great mood every time I go to a Hot Power yoga class. I come back refreshed and full of energy. Dr. C: Is there a time of day you find works best for your yoga classes? Dr. Wentz: Yes, at 10:30 am. I get up and do my thing for a little while first. I like to go at the beginning of the day, as it puts my day in a positive light and makes me very happy. I know everyone doesn’t have the luxury to do it in the middle of the day, if they work 9-5, so going on the weekends or in the mornings may work for some. When I was working 9-5, I went after work, and it was still amazing. Dr. C: So, you found going at a different timeframe still helpful? Dr. Wentz: Oh, yeah, for sure. Dr. C: You said four times a week is your favorite frequency? Dr. Wentz: I usually go three times a week. Then, I will go hiking twice a week, if it’s nice outside. Dr. Wentz: Yoga makes you feel really relaxed and good in your own skin. You feel like you have used your muscles and your body. The nice thing is you also get to see progress. That little pose you were having a hard time with a few weeks ago, gets easier if you keep doing it and are consistent with it. You also learn to breathe through the tough times, which translates into daily life, as well. Dr. C: Wow, really cool stuff. Dr. Izabella Wentz, world-wide thyroid pharmacist, and yoga is the trick. She recommends Vinyasa yoga three times a week in the mid-morning, or whenever works well. That’s great and super helpful. Dr. Wentz: Absolutely. As for things I try not to do, I actually have to cut out caffeine if my adrenals are really stressed. That is a big thing for me. I will go cold turkey on caffeine. Dr. C: Do you know anything about your genotype as far as clearance—if you’re more sensitive to it or not? Dr. Wentz: I am just having them test it, and I sent the test kit in last week. I was wondering the same thing—if I am someone who is more sensitive to caffeine. You have done that test, right? Dr. C: I am the worst with being caffeine-sensitive. That is not true for everyone. There are others who do fine with it, but I totally resonate with you on that. Dr. Wentz: I think I feel better on the caffeine, and it gives me more energy, but it really does not. It just makes me more tired. When I get off the caffeine, I will have hot lemon water in the mornings, which gives me more energy than when I drink caffeine. It has been very helpful for me to know I need to cut back on caffeine if I am ever feeling stressed. Dr. C: So, go low on the caffeine and lots of yoga. Got it. Good stuff. Thank you so much for joining us and giving us your insights. We will provide some links where you all can learn more about Dr. Wentz and how to keep up with her work. Dr. Wentz: Thank you so much Dr. Christianson. It has been my pleasure.